New Delhi: He handled the heights of rock stardom as lead singer of Queen, but few are aware of Freddie Mercury’s days handling baggage at Heathrow Airport. Any travellers landing at Terminal 5 on September 5th can also look out for Queen songs on Arrivals boards, whilst Queen memorabilia will go on display in the departures area next month. To celebrate the singer’s birthday on September 5, any customer who is called Freddie, Frederick or the legend’s real name, Farrokh, who is departing from Terminal 5 will be invited along with their traveling companions to use British Airways’ First lounge, accessed through the exclusive First Wing. 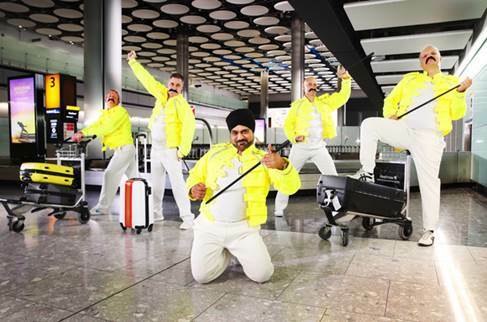 Virinder Bansal, a Baggage Service Manager at Heathrow said: “Freddie Mercury was a truly British icon and I am delighted to ‘Break Free’ and celebrate his iconic life with my colleagues. We hope passengers at Terminal 5 enjoy our surprising and unique welcome to the UK, before we return to work. After all, The Show Must Go On”.